This amazing Atchafalaya Basin sunrise photograph, plus many more Louisiana photographs, can be purchased in this gallery. 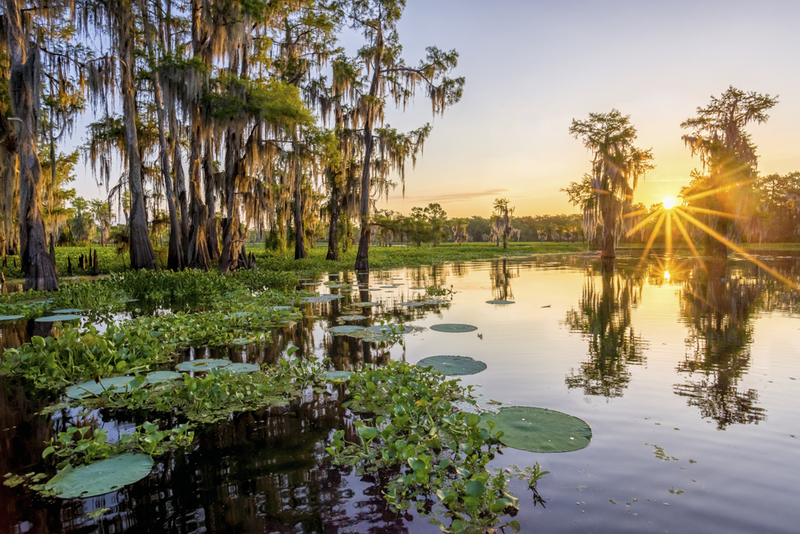 Louisiana swamps are the subject of famous songs (think Jerry Reed’s “Amos Moses”), as well as stories of alligators, cypress trees and mosquitoes big enough to carry you away. Some of these stories aren’t quite true — but the beauty that everyone who visits talks about is a fact. And the amazing photographs in this Louisiana Swamp Photography gallery captures the scenic landscapes. Just click here, choose the images you love below, and you can purchase a fine-art print to hang on your wall — so you can always transport yourself into the beauty that is the Louisiana swamp. Each photograph can be purchased as a canvas gallery wrap, a fine-art print, a framed print, or a metal print. Other options include greeting cards, tote bags, and iPhone and Android covers. Each print is printed and shipped by the world’s foremost fine-art supplier — Fine Art America — and come with a 30-day money-back guarantee.